Objective: To estimate the risk of lung cancer in lifelong non-smokers exposed to environmental tobacco smoke. Design: Analysis of 37 published epidemiological studies of the risk of lung cancer (4626 cases) in non-smokers who did and did not live with a smoker. The risk estimate was compared with that from linear extrapolation of the risk in smokers using seven studies of biochemical markers of tobacco smoke intake. Main outcome measure: Relative risk of lung cancer in lifelong non-smokers according to whether the spouse currently smoked or had never smoked. Results: The excess risk of lung cancer was 24% (95% confidence interval 13% to 36%) in non-smokers who lived with a smoker (P<0.001). Adjustment for the effects of bias (positive and negative) and dietary confounding had little overall effect; the adjusted excess risk was 26% (7% to 47%). The dose-response relation of the risk of lung cancer with both the number of cigarettes smoked by the spouse and the duration of exposure was significant. The excess risk derived by linear extrapolation from that in smokers was 19%, similar to the direct estimate of 26%. Conclusion: The epidemiological and biochemical evidence on exposure to environmental tobacco smoke, with the supporting evidence of tobacco specific carcinogens in the blood and urine of non-smokers exposed to environmental tobacco smoke, provides compelling confirmation that breathing other people's tobacco smoke is a cause of lung cancer. Ten years ago scientific committees and national organisations concluded that exposure to environmental tobacco smoke (also called passive smoking) is a cause of lung cancer.1 2 3 4 Substantial additional evidence has since been published, and we report a new analysis. The additional data permit a more precise estimate of the size of the association, with a further assessment of whether it is cause and effect by seeking a dose-response relation and examining whether sources of bias and confounding could account for the association. We also compared the direct estimate of risk from epidemiological studies with that from a low dose linear extrapolation of the risk in smokers using biochemical markers of exposure to tobacco smoke. As before,5 the estimate of effect was the relative risk of lung cancer in lifelong non-smokers according to whether the spouse currently smoked or had never smoked. Spousal exposure is the best available measure: it is well defined and has been validated using biochemical markers.6 7 8 9 It reflects exposure in general because non-smokers who live with smokers tend to be more exposed to tobacco smoke from other sources, because they are more likely to mix socially with smokers.6 Workplace exposure varies considerably and is difficult to measure. Studies of environmental tobacco smoke and lung cancer were identified from Medline, the citations in each study, and consultation with colleagues. We included studies comparing the risk of lung cancer in lifelong non-smokers according to whether the spouse (cohabitees are included in this term) currently smoked or had never smoked. There were five cohort and 34 case-control studies.10 11 12 13 14 15 16 17 18 19 20 21 22 23 24 25 26 27 28 29 30 31 32 33 34 35 36 37 38 39 40 41 42 43 44 45 46 47 48 Twenty nine studies were in peer reviewed journals, four in books with an ISBN number, two in peer reviewed doctoral theses, and three in published proceedings of scientific conferences; one study was an official report from a scientific organisation. We excluded studies with fewer than five cases of lung cancer (too few to calculate an odds ratio),49 50 those that did not report separate results in non-smokers (the proportionate effect of exposure to environmental tobacco smoke is much smaller in smokers),51 52 53 54 55 56 57 58 and those that did not have controls59 or had controls with smoking related diseases.60 We excluded studies in which the effects of exposure to environmental tobacco smoke and radon could not be distinguished61 and studies that were duplicate publications of the same cases.62 63 64 65 66 67 68 69 We also excluded three studies in which exposure from a spouse and exposure outside the home were not distinguished70 71 72 and one unpublished study that had been submitted to the United States Occupational Safety and Hygiene Authority73; inclusion of these four studies would have altered the summary relative risk estimate by less than 1%. In 35 studies lung cancer was generally (86%) confirmed histologically or cytologically; in four it was not stated how it was diagnosed.10 16 30 38 In the case-control studies controls were selected from the general population in 17 studies,14 19 22 23 24 25 26 27 28 29 30 31 32 33 34 35 36 37 38 39 40 41 42 43 47 69 and from patients with non-smoking-related diseases in 17 studies.1 12 13 15 17 18 20 21 27 29 30 33 34 41 42 44 45 Age in years was generally the same in cases and controls; the age adjusted estimate was used in three studies in which it was not.30 40 69 We used odds ratios unadjusted for potential confounding factors except in four studies, in which only adjusted estimates were available.19 30 40 69 For the cohort studies we used the published age adjusted relative risks (and 95% confidence interval). The relative risk estimates from the studies were pooled using the method of DerSimonian and Laird,74 75 which allows for heterogeneity between studies by weighting each study using the within and between study variance. If there is no heterogeneity, weighting is by the inverse of the variance (fixed effects). We estimated the risk of lung cancer in non-smokers exposed to environmental tobacco smoke by extrapolating from the risk in smokers, using the urine or saliva concentrations of cotinine and nicotine (both sufficiently tobacco specific) in each. A weighted average ratio was calculated from all such studies, identified using Medline. Table 1 shows details of the 39 (five cohort and 34 case-control) studies. Seven showed a significant excess risk. The pooled relative risk of lung cancer from the 37 studies on women was 1.24 (95% confidence interval 1.13 to 1.36) (P<0.001)—a 24% excess risk among lifelong non-smokers with spouses who smoked. Inclusion of the nine studies of men and the two reporting only on men and women combined made little difference (pooled relative risk 1.23 (1.13 to 1.34)). The following results are based only on the 37 studies of women and exposure from their husbands (cohabitants again included) because most of the cases of lung cancer (91%) and most of the data necessary to quantify the effects of bias and confounding were in women. Figure 1 is a cumulative plot of the pooled relative risk of lung cancer and exposure to environmental tobacco smoke in non-smokers from all studies available each year up to 1997. It shows that the addition of further studies over time has not materially changed the estimate, so our current estimate of 1.24 is robust. Data on the dose-response relation between the number of cigarettes smoked by the husband and the risk of lung cancer was reported in 16 studies.10 13 16 18 20 22 24 25 28 30 33 41 42 44 47 48 Figure 2 (a) shows data from one such study28 with a significant trend. For each study a linear regression analysis was performed between the relative risk (in logarithms) and the number of cigarettes smoked by the husband. The summary estimate (allowing for the within and between study variation74 76) shows a significant dose-response relation. Risk increases by 23% (14% to 32%) for every 10 cigarettes smoked per day by the husband (88% if he smoked 30). Eleven studies14 20 24 26 28 33 40 41 43 47 48 examined risk according to the number of years a woman lived with a smoker. Figure 2 (b) shows the results from one such study.28 The summary estimate showed a significant increase in risk with increasing duration of exposure. Risk increases by 11% (4% to 17%) for every 10 years of exposure (35% for 30 years' exposure). These results were not dependent on constraining the regression line through the relative risk of 1.0 by the inclusion of women with spouses who did not smoke. Several studies reported on the histological type of lung cancer. The pooled relative risk was 1.58 (1.14 to 2.19) for squamous and small cell carcinoma13 18 22 23 25 33 39 40 43 77 and 1.25 (1.07 to 1.46) for adenocarcinoma alone.17 18 19 27 33 39 40 43 Smoking itself is more strongly related to squamous and small cell carcinoma than adenocarcinoma, so this difference, though not significant (P=0.2), is consistent with the view that exposure to environmental tobacco smoke is equivalent to low dose smoking. The excess risk of lung cancer in non-smokers who live with smokers has been claimed to be entirely attributable to bias.77 We quantified two sources of bias and one source of confounding that may affect the relative risk of lung cancer in the studies. Smoking prevalence was specified in individual studies; if it was not we used national data. Aggregation ratio—Estimates of the aggregation ratio generally lie between 2 and 4.5 14 20 32 78 79 80 81 82 83 84 85 86 We used an estimate of 3. The proportion of ever smokers misclassified as never smokers was derived by adding two separate estimates of misclassified current and former smokers. The first is the proportion of all ever smokers who are current smokers misclassified as never smokers, which is 3.1% and is estimated as follows. Of reported non-smokers, 2.0% are likely to be current smokers from nicotine or cotinine concentrations (table 3). Of British women, 53% report that they are never smokers, 21% that they are former smokers, and 26% that they are current smokers.90 Hence, 1.48% of all women are current smokers who report being never or former smokers (2.0%×(53%+21%)); these are 3.1% of all ever smokers (1.48%/(21%+26%)). The second is the proportion of all ever smokers who are former smokers misclassified as never smokers, which is 3.8% and is estimated from responses to surveys on smoking by the same people on two separate occasions as follows. In one study of 1296 never smokers, 851 former smokers, and 1127 current smokers, 102 of the smokers claimed to be never smokers at a subsequent interview some years later.91 Therefore, 5.1% (102/(851+1127)) of ever smokers were former smokers who reported themselves as never smokers. In another study of similar size the estimate was 2.5%92; the average of these two estimates is 3.8%. The proportion of all ever smokers in Great Britain who are misclassified as never smokers is, therefore, about 7% (3.1%+3.8%). The relative risk of lung cancer in misclassified ever smokers was obtained separately for misclassified current and former smokers. Women who currently smoke but report themselves as never smokers tend to be light smokers; the cotinine concentrations in misclassified women in table 3 were about 30% of the mean or median concentration in reported active smokers. Their risk of lung cancer will be correspondingly low. The relative risk in women is 12 on average,93 an 11-fold excess risk, so the excess risk in these women is 3.3 (30%×11), and the relative risk is 4.3. Former smokers reporting to be never smokers are likely to have given up smoking long ago and to have smoked less than continuing smokers.77 Most gave up at least 10 years previously (N Britten, personal communication), and even if they smoked 20 cigarettes a day their risk of lung cancer would only be about 1.5.93 The estimated overall relative risk for misclassified current and former smokers together is therefore 3.0 (average of 4.3 and 1.5, weighted by the proportions of current (26%) and former (21%) smokers90). These estimates of the determinants of misclassification bias are similar to those obtained in the previous analysis,5 despite the additional data now available; they are therefore likely to be robust. The relative risk estimates from each of the 37 studies were adjusted for misclassification bias; the method, a modification of that used before,5 is described in the Appendix 1. Table 4 shows estimates of the overall adjusted relative risk estimate according to various combinations of the determinants of misclassification bias. Implausibly high values are required to reduce the observed relative risk of 1.24 to a value that is not significant. With the most likely values (listed above), the observed relative risk in the 37 studies of 1.24 (1.13 to 1.36) is reduced to 1.18 (1.06 to 1.30) (P<0.001). In the epidemiological studies the reference group—non-smoking women living with non-smokers—was taken to have no exposure and no increase in risk. Some of these women would have been exposed to environmental tobacco smoke from other sources. The average urinary cotinine in non-smokers with a non-smoking spouse is not zero,6 7 8 9 yet nicotine from tobacco smoke is, for practical purposes, the only source of cotinine. This increase in risk in the reference group will dilute (reduce) the relative risk estimate. This can be corrected by using data on urinary cotinine concentrations.5 In four studies urinary cotinine concentration in non-smokers living with smokers was, on average, three times that in non-smokers living with non-smokers.6 7 8 9 If × is the excess risk of lung cancer in non-smokers living with a non-smoker, then 3× is the excess risk in non-smokers living with a smoker. The observed relative risk (1.24) is equal to (1+3×)/(1+×), so ×=0.14. The risk in non-smokers living with a smoker relative to non-smokers with no exposure to environmental tobacco smoke (urinary cotinine zero) is thus 1+3×=1.42 (1.21 to 1.66). In nine studies of women who had never smoked,29 33 94 95 96 97 98 99 100 low fruit and vegetable consumption was associated with a higher risk of lung cancer, suggesting that nutrients in fruit and vegetables may protect against lung cancer. Smokers eat less of these foods than do non-smokers,101 102 103 104 and non-smokers who live with smokers eat less of them than do non-smokers who live with non-smokers.48 105 106 107 108 Part of their excess lung cancer risk could, therefore, arise through dietary confounding. Adjustment of the observed relative risk of 1.24 (1.13 to 1.36) for misclassification bias reduced it to 1.18 (1.07 to 1.31); adjustment for dietary confounding further reduced it to 1.16 (1.04 to 1.27), but adjustment for exposure to environmental tobacco smoke in the reference group increased it to 1.26 (1.06 to 1.47). The effects tend to cancel, and the unadjusted (observed) pooled relative risk is a valid estimate of the true risk. The relative risk of lung cancer in men who currently smoke compared with never smokers is about 20 (excess risk 19).93 110 (The lower risk in women reflects fewer years of smoking, but they have been exposed to environmental tobacco smoke from men for longer.) The relation between the intake of tobacco smoke and the risk of lung cancer is quadratic, but it is almost linear up to about 25 cigarettes a day.111 It is, therefore, possible to estimate the risk due to exposure to environmental tobacco smoke by linear extrapolation. Table 5 summarises the results of seven studies measuring the urine or saliva concentration of nicotine and cotinine. In non-smokers exposed to environmental tobacco smoke, marker concentrations are about 1.0% of those in smokers. As cotinine and nicotine are tobacco specific, non-smokers exposed to environmental tobacco smoke have about 1% of the exposure to tobacco smoke of smokers and therefore 1% of the excess risk of lung cancer—19% (1% of 19). This is similar to the estimate of 20% from a low dose extrapolation based on an analysis of pooled data from nine large cohort studies of the risk of lung cancer according to cigarette consumption.116 The indirect (19%) and direct (26%) estimates of excess risk are similar. Carcinogens in environmental tobacco smoke are inhaled and pass into the blood. Experimental exposure of non-smokers to tobacco smoke increased the urinary concentration of a tobacco specific carcinogen,117 and non-smokers exposed to environmental tobacco smoke have raised blood concentrations of tobacco specific carcinogen adducts—for example, DNA and haemoglobin adducts.118 119 120 121 It is therefore to be expected that exposure to environmental tobacco smoke causes cancer. This analysis compared with the previous one5 uses three times as many studies (37 v 13), with seven times as many cases of lung cancer (4626 v 676). The pooled estimate of the excess risk (24%) is more precise (95% confidence interval 13% to 36%). Despite additional data on the two sources of bias, the previous estimates of their size did not materially change, and are therefore robust.5 Bias and confounding do not explain the effect, and the adjusted estimate of the excess risk was 26%. The finding of a significant dose-response relation between the risk of lung cancer and the extent of exposure to environmental tobacco smoke adds weight to the evidence that the association between exposure and lung cancer is causal. There was no evidence of publication bias against negative studies. Seven studies found a significant (P<0.05) positive result. If there were no association, the probability of such a result arising by chance is 1 in 40, so a total of 280 studies (7×40) would be required to generate the seven significant ones. It is implausible that there should be as many as 241 unpublished studies to 39 published ones. The similarity of the direct estimate of lung cancer due to environmental tobacco smoke and the indirect estimate from extrapolating from the risk in smokers, the evidence of a dose-response relation, the inability of bias or confounding to explain the association, and the presence of tobacco specific carcinogens in the blood and urine of non-smokers lead to an inescapable conclusion that exposure to environmental tobacco smoke is a cause of lung cancer. The estimated excess risk of 26% corresponds to several hundred deaths per year in Great Britain. Our review corroborates and strengthens earlier conclusions that environmental tobacco smoke causes lung cancer. We thank Richard Doll, Robert Carter, Robert Curnow, and Richard Peto for their helpful comments on an earlier version of this article that was submitted to the Scientific Committee on Tobacco and Health at the Department of Health. Funding: Department of Health. The views expressed are those of the authors and not necessarily those of the Department of Health. The method used to adjust for misclassification bias was that previously used5 with two modifications (P Lee, personal communication, 1986). The proportion of true ever smokers misclassified as never smokers was used; previously it was applied to reported ever smokers, and the risk of lung cancer in misclassified smokers was expressed relative to that in all reported non-smokers; previously it was relative to true non-smokers married to non-smokers. The difference in results is minor. In the previous analysis5 the relative risk adjusted for misclassification was 1.30; with the modification, the estimate was 1.28. The method involves first obtaining estimates of the proportions of individuals in a population according to the reported and true smoking statuses of husbands and wives (table 6). The values S1, S2, N1, N2, s1, s2, n1, and n2 can be estimated using (a) the aggregation ratio C=(S1xN2)/(S2xN1) (our best estimate was C=3) and (b) the proportion of true female ever smokers misclassified as never smokers (D), where S1=(1D)xs1 and S2=(1D)xs2, (our best estimate was D=7%). Table 7 shows the proportion of women who are reported non-smokers according to their true smoking status and their risk of lung cancer. The observed relative risk from each study (RRobs) and the relative risk in smoking women who are misclassified as non-smokers compared with all reported non-smokers (RRmis) are known (see box).
. Environmental tobacco smoke: measuring exposures and assessing health effects. Washington, DC: National Academy Press, 1986.
. Fourth report of the independent scientific committee on smoking and health. London: HMSO, 1988.
. Effects of passive smoking on health. Report of the NHMRC Working Party on the effects of passive smoking on health. Canberra: Australia Government Publishing Service, 1987.
. Does breathing other people's tobacco smoke cause lung cancer? BMJ 1986;293:1217–22.
. Validation of studies on lung cancer in nonsmokers married to smokers. Lancet 1984;i:1067.
. Relation of urinary cotinine concentrations to cigarette smoking and to exposure to other people's smoke. Thorax 1990;45:356–61. Exposure of nonsmoking women to environmental tobacco smoke: a 10-country collaborative study. Cancer Causes and Control 1990;1:243–52.
. Exposure to environmental tobacco smoke in the household and urinary cotinine excretion, heavy metals retention and lung function. Arch Environ Health 1992;47:357–63.
. Time trends in lung cancer mortality among nonsmokers and a note on passive smoking. J Natl Cancer Inst 1981;66:1061–6.
. Lung cancer in non-smokers in Hong Kong. In: Grundmann E ed. Cancer campaign. Vol 6. Cancer epidemiology. New York: Gustav Fischer, 1982:199–202.
. Passive smoking and lung cancer. Lancet 1983;ii:595–7.
. Lung cancer and passive smoking: conclusion of the Greek study. Lancet 1983;ii:677–8.
. The causes of lung cancer in Texas. In: Mizell M, Corres P eds. Lung cancer causes and prevention. New York: Verlag Chemie International, 1984:83–99.
. Lung cancer in nonsmokers. Cancer 1984;53:1214–21.
. Cancer mortality in nonsmoking women with smoking husbands based on a large-scale cohort study in Japan. Prev Med 1984;13:680–90.
. Involuntary smoking and lung cancer: a case-control study. J Natl Cancer Inst 1985;75:463–9.
. Smoking and other risk factors for lung cancer in women. J Natl Cancer Inst 1985;74:747–9.
. Passive smoking and lung cancer among Japanese women. Cancer Res 1986;46:4804–7.
. Relationship of passive smoking to risk of lung cancer and other smoking-associated diseases. Br J Cancer 1986;54:97–105.
. Measurements of passive smoking and estimates of lung cancer risk among non-smoking Chinese females. Int J Cancer 1987;39:162–9.
. Passive smoking and lung cancer in Swedish women. 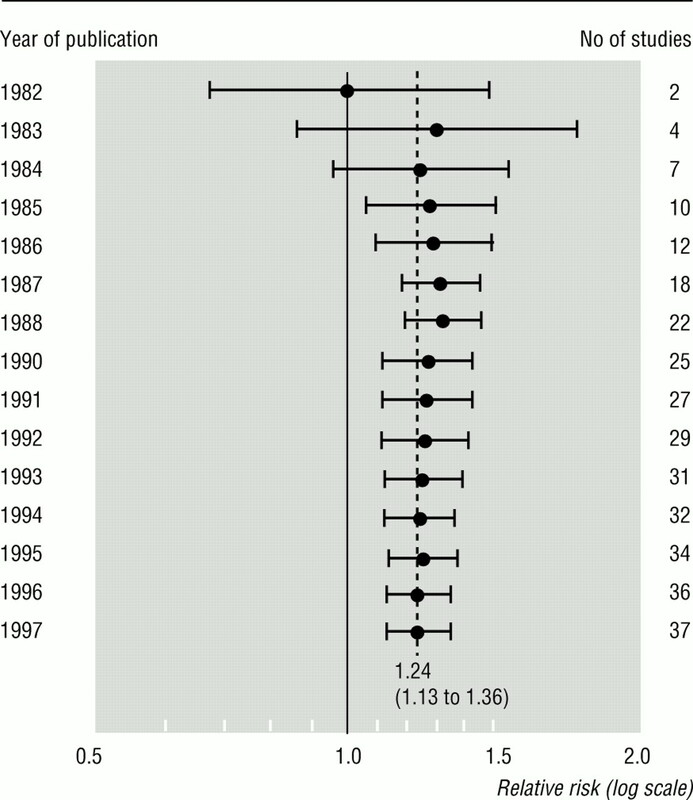 Am J Epidemiol 1987;125:17–24.
. Marriage to a smoker and lung cancer risk. Am J Public Health 1987;77:5989–602. Smoking, passive smoking and histological types in lung cancer in Hong Kong Chinese women. Br J Cancer 1987; 56:673–8. Lung cancer among Chinese women. Int J Cancer 1987;40:604–9.
. Risk factors for adenocarcinoma of the lung. Am J Epidemiol 1987;125:25–34.
. On the relationship between smoking and female lung cancer. In: Aoki M, Hisamichi S, Tominaga S eds. Smoking and health. Amsterdam: Elsevier Science, 1988:483–6. A case-control study of lung cancer in non-smoking women. Tohoku J Exp Med 1988;154:389–97.
. Passive smoking and lung cancer in women. In: Aoki M, Hisamichi S, Tominaga S eds. Smoking and health. Amsterdam: Elsevier Science, 1988:283–5.
. Passive smoking and cardiorespiratory health in a general population in the west of Scotland. BMJ 1989;299:423–7.
. Passive smoking and diet in the etiology of lung cancer among non-smokers. Cancer Causes and Control 1990;1:15–21.
. Association of indoor air pollution and lifestyle with lung cancer in Osaka, Japan. Int J Epidemiol 1990;19:S62–6. Lung cancer among women in north-east China. Br J Cancer 1990;62:982–7. Lung cancer and exposure to tobacco smoke in the household. N Engl J Med 1990;323:632–6.
. Smoking and other risk factors for lung cancer in Xuanwei, China. Int J Epidemiol 1991;20:26–31.
. Passive smoking and lung cancer in nonsmoking women. Am J Public Health 1992;82:1525–30. Environmental tobacco smoke and lung cancer risk in nonsmoking women. J Natl Cancer Inst 1992;84:1417–22.
. Exposure to environmental tobacco smoke and female lung cancer in Guangzhou, China. Proceedings of Indoor Air 1993;1:511–6.
. Indoor air pollution and lung cancer in Guangzhou, People's Republic of China. Am J Epidemiol 1993;137:145–54. Environmental tobacco smoke and lung cancer in nonsmoking women. A multicenter study. JAMA 1994;271:1752–9.
. Relation between exposure to environmental tobacco smoke and lung cancer in lifetime nonsmokers. Am J Epidemiol 1995;142:141–8.
. Role of outdoor and indoor air pollution in the etiology of lung cancer [in Russian]. Vestn Ross Akad Med Nauk 1995;4:6–10.
. Passive smoking and lung cancer among nonsmoking women in Harbin, China. International symposium on lifestyle factors and human lung cancer, China 1994. Lung Cancer 1996;14:S237.
. Lung cancer in nonsmoking Chinese women: a case-control study. International symposium on lifestyle factors and human lung cancer, China 1994. Lung Cancer 1996;14:S93–8. Environmental tobacco smoke and lung cancer mortality in the American Cancer Society's cancer prevention study II. Cancer Causes Control 1997;8:57–64.
. Passive smoking in adulthood and cancer risk. Am J Epidemiol 1985;121:37–48.
. Effect of passive smoking in lung cancer development in women in the Nara region. Gan No Rinsho 1988;34:21–7.
. Respiratory cancer in a Scottish industrial community: a retrospective case-control study. J Soc Occup Med 1986;36:2–8.
. A case control study of female lung cancer at Xuhui District in Shanghai. Chin J Prev Med 1989;23:93–5.
. The environmental factors of lung cancer in family women, Tianjin. Chin J Clin Oncol 1990;17:195–8.
. Lung cancer in women in the Niagara region Ontario: a case-control study. Can J Public Health 1991;82:304–9.
. Risk factors of lung cancer by histological category in Taiwan. Anticancer Res 1993;13:1491–500.
. Combined analysis of case-control studies of smoking and lung cancer in China. Lung Cancer 1994;14(suppl 1):S161–70.
. Indoor burning coal air pollution and lung cancer-a case-control study in Fuzhou, China. International symposium on lifestyle factors and human lung cancer, China 1994. Lung Cancer 1996;14:S113–20.
. Passivrauchen als Lungenkrebsurache bei Nichtraucherinnen. Medisinische Klinik 1983;78:54–9.
. Women and lung cancer: a comparison of active and passive smokers with nonexposed nonsmokers. Cancer Detect Prev 1994;18:421–30. Indoor radon exposure and active and passive smoking in relation to the occurrence of lung cancer. Scand J Work Environ Health 1988;14:286–92.
. Non smoking wives of heavy smokers have a higher risk of lung cancer: a study from Japan. BMJ 1981;282:183–5.
. Lung cancer and passive smoking. Int J Cancer 1981;27:1–4.
. The effects of environmental tobacco smoke in two urban communities in the west of Scotland. Eur J Repir Dis 1984;65(suppl 133):121–6.
. Passive smoking is a risk factor for lung cancer in never smoking women in Hong Kong. In: Aoki M, Hisamichi S, Tominaga S eds. Smoking and health, 1987. Amsterdam: Elsevier Science, 1988.
. Epidemiological studies of the relationship between passive smoking and lung cancer. Presentation on the American health foundation study. Proceedings of the winter toxicology forum, Washington, 1990. Washington: Toxicology Forum, 1990:187–99. Lung cancer in nonsmoking women: A multicenter case-control study. Cancer Epidemiol Biomarker Prev 1991;1:35–43.
. Childhood and adolescent passive smoking and the risk of female lung cancer. Int J Epidemiol 1994;23:223–30.
. Smoking and passive smoking in relation to lung cancer in women. Acta Oncologica 1989;28:623–9.
. Analysis and estimates of attributable risk factors for lung cancer in Nanjing, China. International symposium on lifestyle factors and human lung cancer, China 1994. Lung Cancer 1996;14:S107–12. A comparative study of the risk factors for lung cancer in Guangdong, China. International symposium on lifestyle factors in human lung cancer. Lung Cancer 1996;14:S99–105.
. Ischaemic heart disease, lung cancer, and spousal smoking in the National mortality followback survey. Submitted to US Occupational Safety and Health Administration about proposed rules in the Federal Register, Vol 5 (No 65, docket No H-122, 1994).
. Meta-analysis in clinical trials. Controlled Clin Trials 1986;7:177–88.
. A general parametric approach to the meta-analysis of randomized clinical trials. Stat Med 1991;10:1665–77.
. Meta-analysis of epidemiologic dose-response data. Epidemiology 1993;4:218–28.
. A prospective study of the relation between smoking and fertility. Int J Epidemiol 1988;17:378–84. Questionnaire data as predictors of urinary cotinine levels among nonsmoking adolescents. Arch Environ Health 1993;48:230–4.
. Passive smoking in childhood. Am Rev Respir Dis 1986;133:966–73.
. Effects of passive smoking on health of children. Environ Health Perspectives 1985;62:289–95.
. Exposure to cigarette smoking and children's growth. Int J Epidemiol 1985;14:402–9.
. Effects on birth weight and smoking, alcohol, caffeine, socioeconomic factors and psychosocial stress. BMJ 1989;298:795–801.
. Association of infant alimentary and respiratory illness with parental smoking and other environmental factors. J Epidemiol Community Health 1987;41:21–5.
. Passive smoking and lung cancer association: a result of bias? Human Toxicol 1987;6:517–24.
. Assortative marriage for smoking habits. Ann Hum Biol 1980;7:449–56.
. Nicotine concentrations in urine and saliva of smokers and nonsmokers. BMJ 1982;284:1002–4.
. Carboxyhemoglobin, cotinine and thiocyanate assay compared for distinguishing smokers from non-smokers. Clin Chem 1984;30:1377–80.
. Use of serum cotinine to assess the accuracy of self reported non-smoking. BMJ 1986;293:1306.
. Living in Britain: results from the 1994 general household survey. London: HMSO, 1996.
. Validity of claims to lifelong nonsmoking at age 36 in a longitudinal study. Int J Epidemiol 1988;17:525–9.
. Smoking attributable cancer mortality in 1991: is lung cancer now the leading cause of death among smokers in the United States? J Natl Cancer Inst 1991;83:1142–8.
. Dietary habits and lung cancer risk among Chinese females in Hong Kong who never smoked. Nutr Cancer 1988;11:155–72.
. Dietary intake and risk of lung cancer in women who never smoked. Nutr Cancer 1992;17:263–70.
. Dietary factors in lung cancer prognosis. Eur J Cancer 1992;28:495–501.
. Vegetables, fruits and lung cancer in the Iowa Women's health study. Cancer Research 1993;53:536–43.
. Differences in dietary intake associated with smoking status. Eur J Clin Nutr 1990;44:185–93.
. Dietary differences in smokers and nonsmokers from two southeastern New England communities. J Am Diet Assoc 1994;94:287–92.
. Interactions between people's diet and their smoking habits: the dietary and nutritional survey of British adults. BMJ 1993;307:1381–4.
. Differences between smokers, ex-smokers, passive smokers and non-smokers. J Clin Epidemiol 1994;47:1143–62.
. Dietary intake of carotene in nonsmokers with and without passive smoking at home. Am J Epidemiol 1989;129:1305–9.
. Dietary patterns of female nonsmokers with and without exposure to environmental tobacco smoke. Cancer Causes Control 1991;2:11–6.
. Reduced plasma ascorbic acid concentrations in nonsmokers regularly exposed to environmental tobacco smoke. Am J Clin Nutr 1993;58:886–90.
. Characteristics of nonsmoking women in NHANES I and NHANES I epidemiologic follow-up study with exposure to spouses who smoke. Am J Epidemiol 1995;142:149–57.
. Mortality in relation to smoking: 40 years' observation on male British doctors. BMJ 1994;309:901–11.
. The dose-response relationship between cigarette consumption, biochemical markers and risk of lung cancer. Br J Cancer 1997;75:1690–3.
. Biochemical markers of smoke absorption and self reported exposure to passive smoking. J Epidemiol Community Health 1984;38:335–9.
. Urinary cotinine as marker of breathing other people's tobacco smoke. Lancet 1984;i:230–1.
. Measurement of current exposure to environmental tobacco smoke. Arch Environ Health 1990;45:74–9.
. Factors determining exposure to passive smoking in young adults living at home: quantitative analysis using saliva cotinine concentrations. Int J Epidemiol 1991;20:126–31.
. Mathematical modelling in risk/exposure assessment of tobacco related lung cancer. Carcinogenesis 1995;16:1465–71.
. A tobacco-specific lung carcinogen in the urine of men exposed to cigarette smoke. N Engl J Med 1993;329:1543–6.
. Elevated blood levels of carcinogens in passive smokers. Am J Public Health 1989;79:1381–4. Carcinogen haemoglobin adducts, urinary mutagenicity and metabolic phenotype in active and passive cigarette smokers. J Natl Cancer Inst 1990;82:1826–31. Relationship between environmental tobacco smoke exposure and carcinogen-hemoglobin adduct levels in nonsmokers. J Natl Cancer Inst 1993;85:474–8. Biomarkers of environmental tobacco smoke in preschool children and their mothers. J Natl Cancer Inst 1994;86:1398–1402.